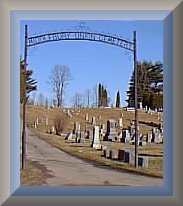 This is from Tioga County Cemetery Inscriptions, Volume 3 reprinted with permission of Rhoda ENGLISH Ladd and retyped by Alice LANDON Whetsel, This was read in 1970 and again in 1972 by Hilda Chance. It is located on Route 249 just west of Keeneyville. Kenyon Earl Ivan 11/27/1933 1/22/1957 Cpl. Pa. Inf.